Is Ashton Kutcher a closet conservative? Not only can the Agriculture Department boast that food stamps feed more than 47 million people in America annually, it turns out taxpayers are also inadvertently feeding ineligible people abroad. The New York Post reports that New Yorkers are using their Electronic Benefit Transfer (EBT) cards — a vehicle for government benefits like food stamps and cash assistance — to purchase groceries, package them in large barrels and ship them to relatives overseas in places like Jamaica, Haiti and the Dominican Republic. The Post reports that in the more Caribbean-heavy areas of the city, supermarkets offer hundreds of 45- to 55-gallon barrels for shipping. Patrons pay roughly $40 in cash for the barrels and fill them with $500 to $2,000 worth of items like rice, beans, pasta, canned milk, and sausages, the Post reported, noting that the goods are less expensive and better quality than those available abroad. For about $70 a shipping company will pick up the barrels and ship them to the Caribbean in about three weeks, according to the Post. As an Agriculture Department spokeswoman told the paper, shipping food purchased with federally funded nutrition benefits is not an acceptable use of the benefits, which are meant to feed eligible people in America, and that state governments should be doing more to stop the practice. The practice is relatively commonplace, according to the Post. But not everybody shipping food abroad is using welfare dollars to do so. If the average American family won a one million dollar state lottery prize, they would receive—after the government confiscated the obligatory taxes— an estimated $25,000 in annual prize money every year for 26 consecutive years. Today, a family with a household income of $23,000 consisting of a father, mother, and two children, live in America at or below the U.S. poverty threshold, and qualify for State and Federal assistance. That assistance can total $25,000-$50,000 per year and unlike the lottery pay-off, entitlements may never end. I am a benevolent person. Yet I have to take pause to consider the necessity of such obscene amounts of government assistance. Contrary to popular liberal opinions, no one in America dies from lack of access to food. Starvation is not an epidemic problem in the United States. America’s most vulnerable families— specifically those with minor children and elderly dependents—are not writhing in pain from malnourishment. I would go as far to say that more people die annually from energy drink overdoses rather than from starvation in America. Our first Lady, Michelle Obama might even back me up, considering she believes we are all too fat and need to go on a diet. Those who work for a living might want to put away shoes, hammers, and other hard objects to keep from throwing them through the computer. A new study shows that on average the government spends $168 per household on various assistance programs, one-fifth more than the median income of $137. As the Republican side of the Senate Budget Committee reported (after all, who else in government is going to do it? 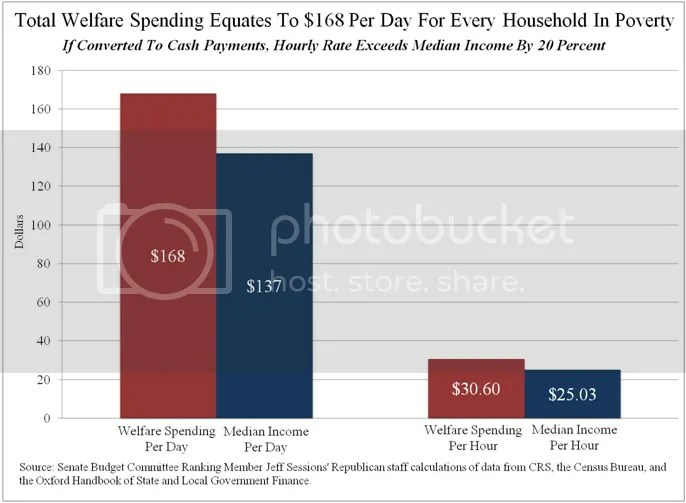 ), welfare spending per hour per household in poverty is $30.60, which is higher than the $25.03 median income per hour. At what point do liberals admit they’re doing more harm than good? If they did that, they’d admit communism and socialism doesn’t work. Instead, they just say it’s never really been tried. For fiscal year 2011, CRS identified roughly 80 overlapping federal means-tested welfare programs that together represented the single largest budget item in 2011—more than the nation spends on Social Security, Medicare, or national defense. The total amount spent on these federal programs, when taken together with approximately $280 billion in state contributions, amounted to roughly $1 trillion. Nearly 95 percent of these costs come from four categories of spending: medical assistance, cash assistance, food assistance, and social / housing assistance. Under the President’s FY13 budget proposal, means-tested spending would increase an additional 30 percent over the next four years. By all means Mr. President, let’s raise taxes on people already paying the majority of the taxes because clearly they aren’t “paying their fair share” to subsize the lives of others already. UPDATE: The report does not say that every household receiving welfare benefits totals $168 but specifically refers to those receiving benefits and living below the poverty line. Also, it should be pointed out the $168 includes all costs incurred by the federal government to deliver benefits, including administrative costs.